Middle and high school students gathered to demand action against e-cigarette epidemic happening right now in their schools. Middle and high school students in St. Lucie County learned about the dangers of drugs and alcohol Thursday. A 'farfromdruggen' event was held in Fort Pierce. Using the hashtag "Not a lab rat," teens were told to warn their peers about the harmful effects of popular products like Juul, the "E-cigarette device that looks like a flash drive. 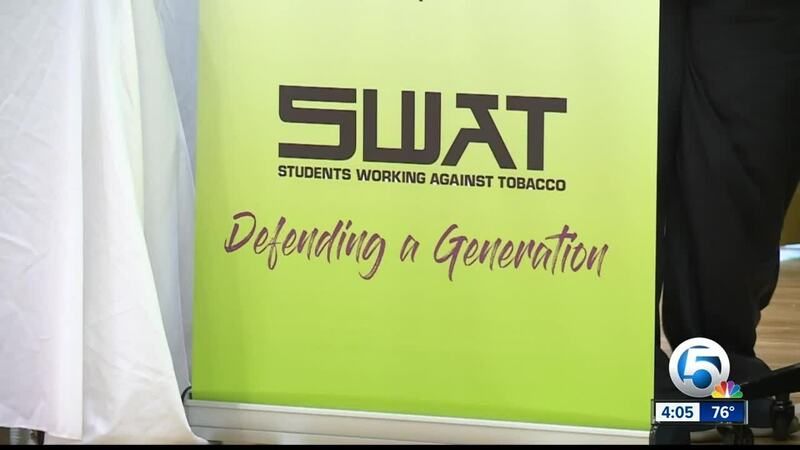 "You know Juuls... we don't know what they do to our bodies so we need to be more cautious and more safe and think twice about what we are putting in our bodies," Kiara Figueroa with Students Working Against Tobacco. "We tend to focus on the opioid crisis and the end results but we want to get ahead of that. We want to talk to the youth on prevention and educate the youth on what's out there before they get caught up in that cycle," said Drug Free St. Lucie coordinator Kristy Conway. Several other drug and alcohol-free organizations on the Treasure Coast were also at today's event.